Moving the Needle: Cody Ransom puts the DBacks ahead with a homer in the seventh, +.381 WPA. Down 3-2 in the seventh, Ransom came up with a man on and absolutely demolished a Clayton Kershaw offering. That put them up 4-3, a lead they’d hold the rest of the way. That’s his 10th career homer, which came in his 226th MLB game. Kelly Johnson: 1 for 4, 1 HR. His two-run shot in the first staked the Diamondbacks to an early lead. It was only his third homer (of 18) against a lefty this year, though he’s actually been better against lefties in his career. Andre Ethier: 2 for 4, 1 2B. His RBI double in the sixth tied the score and set the stage for Juan Rivera’s go-ahead single. 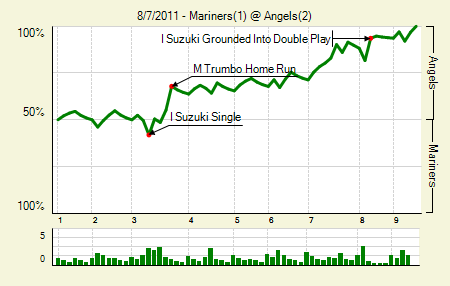 Moving the Needle: Mark Trumbo hits one a long way to open the scoring, +.127 WPA. Any team facing Felix Hernandez probably won’t get many good opportunities, so it’s important to take advantage when they present themselves. Trumbo did in the third inning, when he absolutely crushed a low fastball over the mountains in center to put the Angels up 1-0. They’d grab another run before allowing one in the ninth. Ervin Santana: 8.1 IP, 7 H, 1 R, 1 BB, 7 K. He didn’t allow anything until a solo homer in the ninth, at which point he was removed. Felix Hernandez: 8 IP, 4 H, 2 R, 0 BB, 12 K. He built his Cy Young resume last year by pitching games like this…and having his offense provide similar support. Mike Carp: 3 for 4, 1 HR. His solo shot gave the Mariners a prayer in the ninth. Moving the Needle: Jose Bautista knocks in two with a double, +.191 WPA. 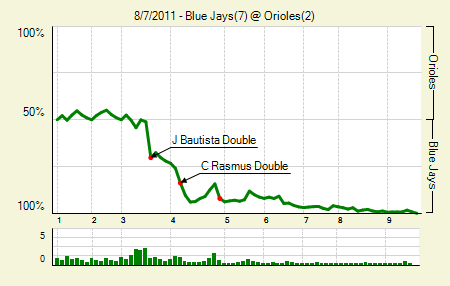 With the score still tied at zero in the third, Bautista came through with two on and two outs in the third. His double brought home both runners and gave the Jays a 2-0 lead. They’d get another two the next inning on their way to a fairly easy victory. Brett Lawrie hit his first major league homer later in the game, too. Ricky Romero: 8 IP, 4 H, 2 R, 0 BB, 5 K. Both runs were on solo homers. He’s allowed three runs in his last three starts (24.1 IP, and all three runs have been on solo shots. Edwin Encarnacion and John McDonald: both 3 for 4, 1 2B. McDonald drove in two, while Encarnacion scored twice. Moving the Needle: Ryan Hanigan caps the comeback in the eighth with an RBI single, +.240 WPA. The Reds led 6-4 in the bottom of the seventh, but their bullpen fell apart and allowed three runs, allowing the Cubs to take the lead. But a half inning later they got things together. A pair of doubles brought home the tying run, and then two batters later Hanigan added his own RBI single to give the Reds an 8-7 lead they’d hold the rest of the way. Marlon Byrd: 3 for 3, 2 2B, 1 BB. He and the man who hit behind him, Blake DeWitt, each knocked in a pair. Todd Frazier: 2 for 4, 1 2B, 1 HR. He now has nine hits of the season, and six have gone for extra bases. 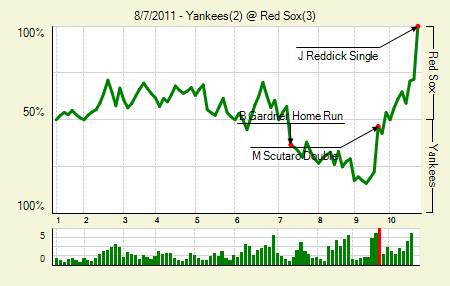 Moving the Needle: Josh Reddick brings home the winning run in the 10th, +.283 WPA. The Yankees held a 2-1 lead heading into the bottom of the ninth, but the Red Sox found a chink in Mariano Rivera’s armor. A Marco Scutaro leadoff double led to the tying run, and then in the 10th the Sox got the winning run via a ground rule double and Reddick’s hit, a liner into the left field corner. The run gave the Sox the series, and the season series, against the Yanks. Brett Gardner: 3 for 5, 1 HR, 2 SB. His solo homer gave the Yanks a lead that looked relatively safe, especially with Rivera coming in. Marco Scutaro: 3 for 4, 1 2B. That double was huge, as it led to the tying run. He also drove in a run earlier in the game. 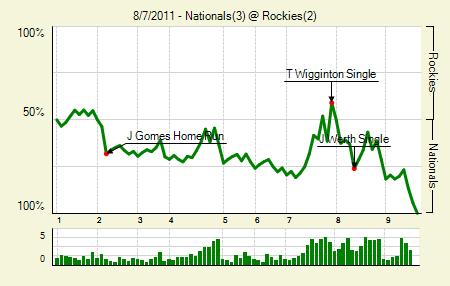 Moving the Needle: Ty Wigginton ties the game in the seventh, +.205 WPA. The Nats took a quick 2-0 lead, and then held it through the sixth. In the seventh the Rockies climbed back, benefitting from an error to score their first run and then Wigginton’s single to get their second run. The Nationals, however, rode a leadoff double in the eighth to plate the go-ahead run. John Lannan: 6 IP, 6 H, 1 R, 4 BB, 3 K. How he continues to make whatever he does work, I have no idea. Jonny Gomes: 2 for 4, 1 HR. His two-run homer in the second put the Nats ahead. Moving the Needle: Mitch Maier triples home a run in the fourth, +.118 WPA. The Royals picked up all four of their runs in the fourth and fifth innings, and they needed every one of them. A ground out brought home the first one, but later in the inning Maier’s triple brought home another. The hit also set him up to score a run. 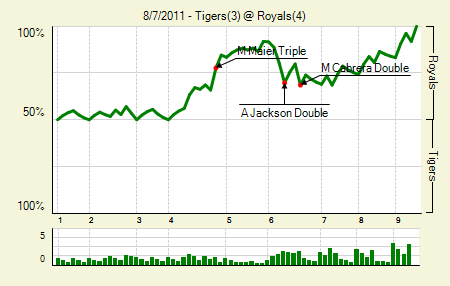 The Tigers rallied a bit in the sixth, scoring three runs, but that’s all they’d get. Johnny Giavotella: 2 for 4, 1 2B, 1 HR. That’s his first big league homer. I’m sure it’s happened fairly recently, but I wonder when the last time two players hit their first MLB homers on the same day. Moving the Needle: Bryan Petersen ties the game in the sixth with a homer, +.288 WPA. The Cardinals jumped out to a 4-2 lead int he top of the sixth, but in the bottom half the Marlins got a little something going with two outs. Brett Hayes doubled, and then Petersen homered to tie the score. 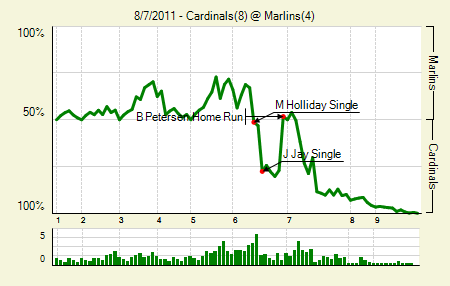 The tie wouldn’t last long, though, as the Cardinals put three on the board in the next half inning. Matt Holliday: 2 for 4, 1 BB. He dove in three runs. Moving the Needle: Brent Lillibridge gets things started with a solo homer, +.110 WPA. 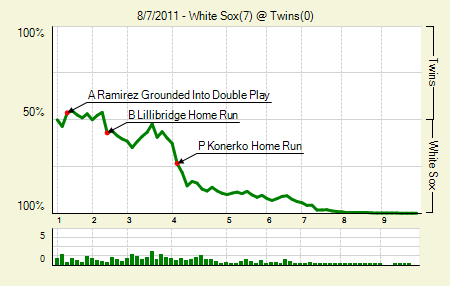 The White Sox scored five of their runs via the homer, and they got started early. Lillibridge’s solo shot in the second was the first of them, giving the Sox a 1-0 lead. They’d break out in the fourth and continue scoring throughout the game. Jake Peavy: 8 IP, 3 H, 0 R, 0 BB, 6 K. It looks as though pushing him back a game was a good idea. With two of his best starts this year coming in this last two games, I wonder if the White Sox end up trading him late in the month if they’re still five or six out. Alex Rios: 2 for 4, 1 2B, 1 HR. That’s his first homer since June 19th, and his first game with two extra base hits since April 7th. He’s now 5 for his last 9 with two doubles and a homer, which is a start. Moving the Needle: Prince Fielder’s two-run shot puts the Brewers ahead early, +.194 WPA. The Brewers got to work early against Astros starter Bud Norris. Fielder put them on the board in the first with a long two-run homer. They’d add another pair in the third and then again in the fifth. Fielder had three hits and scored four runs in the game. Mark Kotsay and Yuniesky Betancourt: both 3 for 5, 1 2B. Betancourt drove in three, while Kotsay scored one and drove in one. Zack Greinke: 7 IP, 4 H, 1 R, 3 BB, 6 K. He also had two wild pitches. He has a 2.1 BB/9, but this is the third time this year he’s walked three in a start. 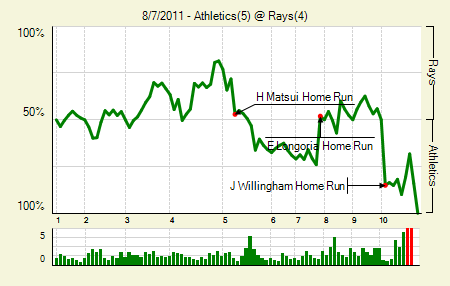 Moving the Needle: Josh Willingham puts the A’s ahead with a homer in the 10th, +.350 WPA. The Rays and A’s went back and for a bit in the middle innings, and after an Evan Longoria homer they were left tied at four. The deadlock persisted until the 10th, when Willingham led off with a solo homer that proved to be the game winner. The Rays did have a chance, thuogh, but they couldn’t capitalize with two on and one out in the bottom of the 10th. David DeJesus: 3 for 5, 1 2B. He scored twice. Casey Kotchman: 3 for 5, 1 HR. Every game of his has me wondering harder which team will give him a contract this winter, because it sure as hell won’t be the Rays. 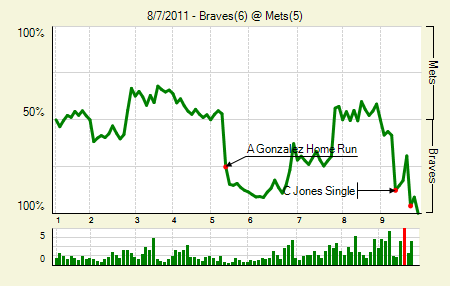 Moving the Needle: Chipper Jones singles home the go-ahead run in the ninth, +.294 WPA. 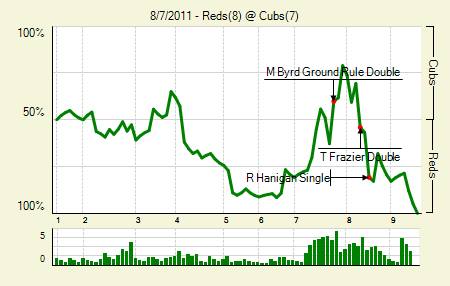 This one had the feel of an early 00’s Mets-Braves game. The lead changed a few times in the early to mid innings, but the big moments came at the end. 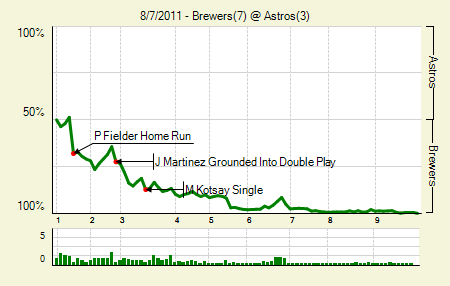 The first came in the seventh, when Angel Pagan doubled home the tying run. Then in the ninth Jones got one he could handle and grounded a single that brought home the winning run. Jose Constanza: 2 for 3, 1 Hr, 1 BB. He scored twice, as did Alex Gonzalez, who had also had a homer among two hits. Jason Bay: 3 for 3, 2 BB. He scored three times in his perfect afternoon. Moving the Needle: Elvis Andrus continues the eighth-inning rally with the go-ahead single, +.224 WPA. For seven innings Josh Tomlin held down the Rangers, but in the eighth everything changed. He allowed a walk and a single to lead off the inning, which chased him from the game. 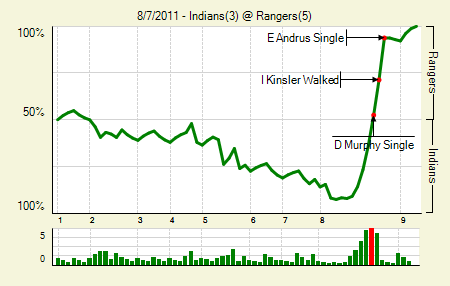 The Indians bullpen them came in and allowed hit after hit: two singles and a walk to make it 3-2, and then Andrus’s single, which put the Rangers ahead by one. All of that came before they recorded an out. 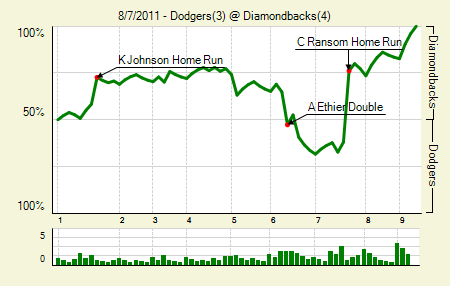 They got an extra run, though that was moot thanks to Mike Adams’s perfect ninth. Michael Brantley: 2 for 4, 1 3B, 1 HR. He was 4 for his previous 29 heading into the series, and he went 4 for 10 in it, including a double, triple, and homer. Ian Kinsler: 0 for 2, 2 BB. His second walk was big, as it forced in a run in the eighth. Moving the Needle: Logan Forsythe extends the Padres lead in the sixth with a two-run single, +.185 WPA. 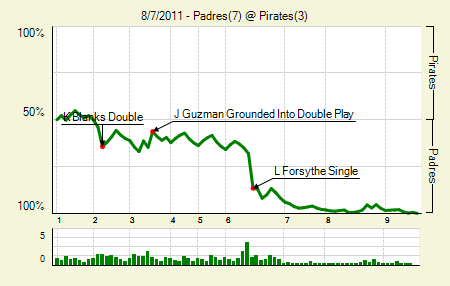 The Padres picked up a run in the second — on a Forsythe ground out — before breaking out in the sixth. Forsythe’s bases-loaded single brought home two and extended the Padres lead to 3-0. They’d get another before really putting the game out of reach in the later innings. Mat Lato: 7 IP, 4 H, 2 R, 1 BB, 7 K. He didn’t allow either of the runs; they were runners he bequeathed in the eighth. Kyle Blanks: 2 for 3, 2 2B, 1 BB. Those were his first two doubles since coming up on July 22nd. In the Pittsburgh series he went 6 for 13 with two doubles, a triple, and two homers. Moving the Needle: Chris Stewart‘s bases loaded single ties the game at one, +.129 WPA. 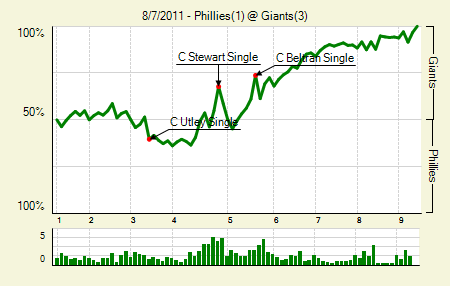 The Phillies took a lead in the third, but the Giants came right back in the fourth to tie the game at one. Stewart’s single was the biggest WPA swing, but Orlando Cabrera‘s sac fly in the fifth put the Giants ahead, and then Jeff Keppinger’s sac fly in the next inning gave them some cushion. Tim Lincecum: He was rolling, too, but got hit by a flying bat in the eighth. PabloSandoval: 2 for 4, 1 2B. His turnaround has been quite remarkable. Imagine San Fran’s position right now if he was playing like he did in 2010. We hoped you liked reading The Morning After: Game Recaps for August 8th by Joe Pawlikowski! nitpick: Scutaro was 4 for 4.